BELIZE CITY, Tues. Nov. 7, 2017–Seven beautiful Garifuna young ladies, each representing their respective Garifuna communities, were contestants in the annual Miss Garifuna Belize Cultural Pageant, which was held at Birds Isle at 6:30 Saturday evening, November 4. The confident and entertaining ladies were Ms. Peine (Punta Gorda): Tyrese Bermudez; Miss Seine Bight (Sein Bide): Enmesh Cruz; Miss Georgetown: Anita Augustin; Miss Hopkins: Aaliyah Augustine; Miss Dangriga: Daynah Marin; Miss Belize City: Ruth Nunez; and Miss Belmopan: Moira Arana. The ladies demonstrated their dance skills and their knowledge of the Garifuna culture with confidence, but at the end of the competition, the judges declared Miss Dangriga, Dayna Marin, the winner, and named her Miss Garifuna 2017/2018. Daynah Marin is presently a fourth form student at Ecumenical High School. She will participate in the official 19th November ceremonies and other activities leading up to Garifuna Settlement Day, November 19. Among the activities she will be participating in officially is the Solidarity Mass on November 19 in Dangriga, and the Yurumein. 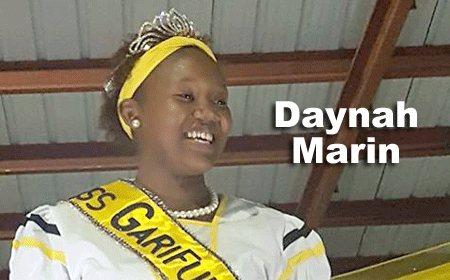 An official of the National Garifuna Council, Dangriga Branch, said that Marin will be traveling to Labuga, Honduras, to represent Belize in the upcoming Miss Garifuna Queen Pageant in that country. The official said that Marin will visit the Gulisi Primary School, where the students are trained in the Garifuna culture, and also, she will talk at school rallies and at other occasions throughout the year or when called to do so by the National Garifuna Council.